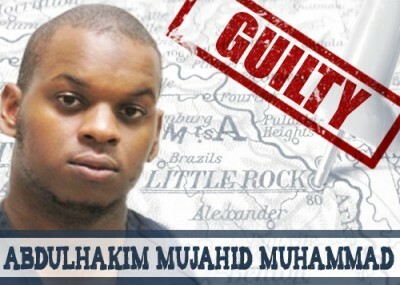 Abdulhakim Mujahid Muhammad didn't deny that he gunned down two U.S. Army soldiers outside a Little Rock, Ark. Army recruiting station. But Muhammad said he didn't commit any crime when he shot Army Pvt. William Long to death and wounded Army Pvt. Quinton Ezeagwula as they took a smoke break on the morning of June 1, 2009. During an interrogation session, Muhammad told Little Rock police and the FBI that the shooting was a holy war and that he was not guilty of murder. "It's an act of retaliation," he said. "There's a war going on," he said. Muhammad's lawyers had argued he was "innocent by reason of mental disease or defect". But on Monday afternoon, Muhammad, who faced capital punishment for Pvt. Long's slaying, stood before Pulaski County Circuit Judge Hubert Wright and pled guilty to more than a dozen charges in connection with shootings. Wright sentenced Muhammad to life imprisonment without parole for capital murder. He received 11 additional life sentences plus 180 years in prison on other charges. Muhammad (aka Carlos Bledsoe) was raised as a Baptist in Memphis, Tenn. He converted to Islam shortly after enrolling at Tennessee State University in Nashville in the fall of 2003. He changed his name to Abdulhakim Mujahid Muhammad and dropped out of school. He grew more distant from his family and tried unsuccessfully to convert his relatives to Islam. His father, Melvin Bledsoe, said he was troubled by the fact that, despite dozens of trips to Nashville to visit his son, he was never able to meet any of the Muslim leaders who were having such a dramatic effect on his son. Melvin Bledsoe believes his son's road to radicalization began in Nashville. In testimony before the House Homeland Security Committee in March, he claimed that some Nashville Muslims helped facilitate Carlos/Abdulhakim's radicalization. In 2007, the Bledsoe family learned that Abdulhakim was planning to travel to Yemen, ostensibly to teach English. They tried to persuade him not to go. On Friday, his older sister, Monica Holley, said that three weeks before he left for Yemen, he looked her in the eye and promised he would stay out of trouble. While many details remain murky, it is clear that Muhammad spiraled downhill during his time in Yemen – a hotbed of Islamist radicalism. While there, he married one of his students. In 2008, he was arrested for overstaying his visa and carrying a fraudulent Somali passport. Muhammad said he was carrying it because he planned to go there to fight a jihad against Jews and Americans. When Melvin Bledsoe, a Memphis small-business owner, learned that his son was in jail overseas, he launched an intensive lobbying campaign to win his son's release. Eventually, State Department officials persuaded the Yemeni government to release Muhammad, and in January 2009 he was deported to the United States against his wishes. The Bledsoe family hoped that it could "Westernize" him upon his return to Memphis. Melvin Bledsoe's tourism firm planned to open a new office in Little Rock, headed by Muhammad. After living with his parents in Memphis for three months, the young man moved to Little Rock. Evidence on his computer showed that Muhammad scouted possible targets in the United States including a child care center, a Baptist church and Jewish organizations before attacking the recruiting center. Muhammad told doctors who examined him that, while jailed in Yemen, he planned to carry out jihad on American soil. He told police that he would have killed more soldiers had he seen them outside the recruiting station, saying he was angry at American soldiers, just as he would be at "anyone who was doing this to our religion." Read more about the Muhammad case here, here, and here.